'Big Screen Boston: From Mystery Street to The Departed and Beyond' by Paul Sherman -- Web special: $12 including shipping! : Book excerpt: "The Brink's Job"
Book excerpt: "The Brink's Job"
I've put up a few excerpts about homegrown movies, but how about some Hollywood stuff? Here is the section on 1978's The Brink's Job, perhaps the most infamous movie production to ever have to struggle through a Boston shoot. The movie's experiences here gave Boston a downright syphilitic reputation in Hollywood. The ironic thing is that, though flawed, the movie is entertaining. Sheldon Leonard!! 1978. Directed by William Friedkin. Written by Walon Green. Based on Noel Behn’s Big Stick-Up at Brink’s. With Peter Falk, Peter Boyle, Allen Goorwitz, Warren Oates, Gena Rowlands and Paul Sorvino. Cinematography by Norman Leigh. THE “CRIME OF THE century” becomes a caper comedy, with bumbling, two-bit thieves lucking into a big haul in director William Friedkin’s rendering of the legendary January 17, 1950 Brink’s robbery. Based on Noel Behn’s fact-based Big Stick-Up at Brink’s and scripted by Wild Bunch writer Walon Green, The Brink’s Job uses the ultimate heist comedy, Italy’s Big Deal on Madonna Street, as its model. Not surprisingly, the 1978 comedy never reaches its predecessor’s level of lunacy in character and deed. But it unearths a few hidden corners of the city (like the “ghost sign” on the back of the Gaiety Theater in its opening sequence), lets production designer Dean Tavoularis (The Godfather) loose in recreating bygone Boston and emerges as an agreeable enough diversion from the director of The French Connection and The Exorcist. There are no bad guys in The Brink’s Job, a perspective accentuated by the casting of charismatic Peter Falk as its hero. His Tony Pino is a crook destined never to taste the big time as the movie starts. He gets pinched in a botched slaughterhouse robbery and, when he gets out and gets back to work, his break-in of a candy factory, complete with pratfalls in piles of gumballs, is almost as comical as it is unproductive. Tony might be unlucky, but brother- in-law Vinnie (the always amusing Allen Goorwitz) is just plain stupid. The way they stumble upon a Brink’s depot, in which stacks of money are being casually toted from armored cars, is dumb luck—but Tony’s determination to penetrate the company’s counting rooms and vault, which “smarter” guys might have assumed are well-secured, is actually admirable. This is a motley-crew movie, and in addition to Tony and Vinnie, there are also bookie Jazz (Paul Sorvino), demolitions expert Specs (Warren Oates), fence McGinnis (Peter Boyle) and lifetime crooks Sandy (Gerard Murphy) and Gus (Kevin O’Connor) in on the job. There’s a definite Runyonesque flavor to their antics, and the comedy hits a groove when the bunch plans the heist (it’s a riot how Specs originally wants to fire a bazooka into the vault from across the street, and can’t imagine how that might be a little conspicuous). When the guys actually carry out the heist, it’s staged as a relatively straight suspense sequence. 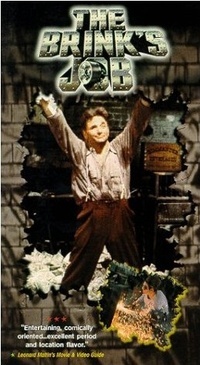 Mirroring the lunacy of the crew is that of obsessive J. Edgar Hoover (Sheldon Leonard), who theorizes the robbery is the “missing link” between Communism and organized crime (in reality, Hoover’s FBI spent $29 million and only ever recovered $52,000 of the $1.2 million in cash and $1.5 million in checks and securities). The Brink’s Job stumbles in its late action, giving a poor sense of elapsed time and omitting much bizarre, real-life intrigue (is this perhaps a consequence of the movie somehow going from 118 minutes in its original release to 104 on video?). The clumsy resolution mutes the movie’s charms. While the locations don’t always scream Boston, they are very effective: the North Terminal Garage Building at Prince and Commercial streets (the same structure where the real robbery happened), the old Dudley elevated Orange Line stop, the Custom House Tower steps for the last big crowd scene, Tony taking his wife (Gena Rowlands) to Rino’s restaurant in East Boston and Stoneham doubling for a Pennsylvania town’s Main Street. Not yet released on DVD as of this writing and out of print on VHS, The Brink’s Job has been all but forgotten by most. But its effect on the relationship between Boston and Hollywood lingered for decades (see below). Of course, that had nothing to do with its content. ►Locations: North End, Financial District, East Boston, Charlestown, Roxbury, Boston; Stoneham. ►Accents: This is a movie you trot out whenever people talk about mangled Boston accents. With Peter Falk, Peter Boyle, Warren Oates, Paul Sorvino and Allen Goorwitz (a/k/a Allen Garfield), among others, The Brink’s Job has as colorful a 1970s ensemble cast as you could hope for. Boyle’s character is an Irishman, so he’s exempt, but Falk’s and Goorwitz’s New York accents dominate, as does Oates’ Appalachian drawl. Falk’s Tony Pino is even given a good favorite Boston exclamation (“Mothah ah Gawd”), but the actor’s attempts to do the accent are middling at best, as are Oates’. Sorvino, who’d played a Boston cabbie in 1972’s Dealing, does better, but is still not that convincing. The amazing thing is that the strongest Boston accent comes from the judge who sends up Specs and Gus, and he’s supposed to be in Pennsylvania. ►Local color: It’s great to see some of the locations here in a movie, like the North Washington Street Bridge. But, in a way, most of the locations are so tucked away that they could be anywhere (since the movie takes place in 1938, 1944 and the 1950s, they had to use tucked-away places that hadn’t been modernized). So local color is lower than expected. There are old Hood and Moxie signs on display and a mention of Narragansett (the race track, not the beer), but not very much “public” action. ►Off the set: The shenanigans surrounding The Brink’s Job forever overshadow the actual movie. First off, the North End’s narrow streets are not friendly to the convoys of trucks and trailers that accompany a major motion picture production. Just try turning an 18-wheeler down Sheafe Street. And stories— some no doubt true, some legend—abound of neighborhood residents finding creative ways of getting courtesy payments to take down TV aerials, air conditioners and other visual impediments to the movie’s authenticity. But these are not the most extreme shenanigans. Two episodes stand out. One is when gunmen barged into the movie’s Stuart Street production office and stole several cans of film from the editing room. In a case of life imitating art, the misinformed robbers then tried to ransom the film, which was practically worthless, since the negative was still in the production’s possession. Paul, you should be blogging all your press. Crosslinks will bring more people here.